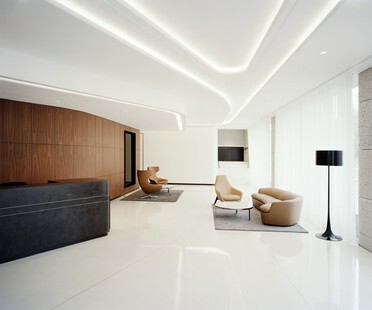 Aerodynamic curves and luxurious finishes are the key features of Powerhouse Company’s interior design for a Dublin-based firm operating in the world of air travel. Elegant simplicity and classical atmospheres characterise the new meeting room of the Austrian Banks and Bankers’ Association designed by AllesWirdGut in the Vienna Stock Exchange. Ireland. 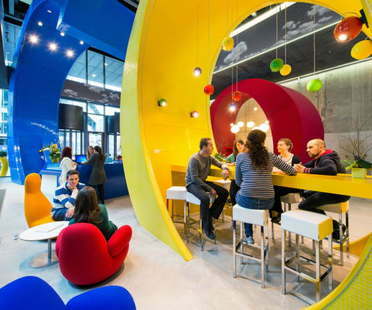 Four buildings in the heart of Dublin to host the explosive growth of Google. Organisation, a holistic philosophy and brand identity are the pillars used by Swiss studio Evolution Design in planning the new home of more than two thousand Googlers. Irish firm, TAKA Architects have designed the new Merrion Cricket Club pavilion in Dublin. Darrell O’Donoghue and David O’Shea of ODOS Architects have designed three homes of steel, glass and cement in an industrial zone in central Dublin. One of the works that best represent the expressive language of Claudio Silvestrin, an architect who favours simplicity and clarity without ever becoming banal or cold. In their project for offices and shops for Dublin City University, Grafton Architects effectively and perspicaciously demonstrate that it is possible to employ a contemporary vocabulary in an established urban and architectural context.